The entire Trek Travel experience is exceptional. You can trust the organization from start to finish. Guides were sensational and riding fantastic. Support on the road was great and as always as a guest the only thing you need to think about is turning the pedals, enjoying good company and drinking and eating. I'll be back! Your adventure begins when you meet your Trek Travel guides at the Firebrand Hotel at 11:00 AM. Enjoy a hearty picnic lunch under the wide open skies of what's known as God's Country, followed by a personal bike fitting session to ensure a comfortable ride on your Trek bicycle before we set off on our first ride. You'll pedal from downtown Whitefish toward Columbia Falls as you make your way to your home for the next 3 nights. Experience glamping on the edge of Glacier National Park on this one-of-a-kind Trek Travel adventure! You'll stay in a luxurious safari style tent with a fireplace, luxury linens and an ensuite bathroom. Your guides will fill you in on what lies ahead during social hour tonight, which will be followed by a delicious dinner at the historic Belton Chalet. Today's junket revolves around the Flathead River. Ride along the North Fork surrounded by evergreens and views of the Whitefish Range. Eventually, the pavement gives way to gravel. If you are a gravel enthusiast, you'll get your fill for the next 10 miles til the road returns to pavement. If gravel isn't your style, you can hop in the van for this section. 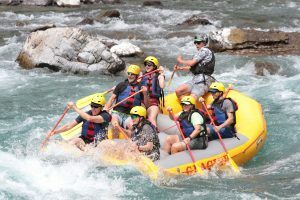 Your ride through this magical landscape ends in West Glacier, where you'll refuel with a packed lunch and suit up for a thrilling float down the Middle Fork of the Flathead River. We’ll be on the water for approximately 2 & 1/2 hours as we make our way through 8 thrilling miles of Class II to III rapids. Be sure to look for bears, moose and other wildlife as you go. Afterwards, it’s time to kickback and toast to another gorgeous day in the great outdoors as your guides host an outdoor Montana-style BBQ. Following dinner, we’ll shuttle back to Under Canvas, where you can stargaze from your private deck before you drift off for a good night’s sleep. Today is a day you're sure to remember for a long time. We're riding Going-to-the-Sun Road, which is one of the most scenic roads in America. This engineering marvel was completed in 1932. It is narrow and windy, snaking around mountainsides to give you magnificent views from every angle. We'll begin with an early 30 minute shuttle to Lake McDonald Lodge. From here, you'll climb past waterfalls, glaciers, lakes, wildflowers, cedar forests and hopefully some of the local wildlife abundant in this stunning refuge. You will surely want to stop at some of the many viewpoints along the way as we make our way to the top of Logan Pass (6,646 ft) and the Continental Divide. Relax and refuel with lunch at the Visitor Center before enjoying an epic descent back to Lake McDonald. We haven’t listed a short option for today’s ride, but rest assured, your guides can provide strategic shuttle options as needed. Tonight, we'll celebrate under the stars with a final social hour and dinner at Under Canvas. It's time to say goodbye to God's Country with a tranquil spin to Lake McDonald and back. Your trip concludes with an 11:00 AM shuttle back to the Firebrand Hotel in Whitefish. You’ll say farewell to your guides here and then continue your adventures, or if you must, take a taxi to the airport. You may be leaving Montana, but Glacier National Park is sure to stay with you for a lifetime. Under Canvas® has perfected the art of luxury camping, allowing you to be close to nature without sacrificing comfort. Stay just a few miles from the western entrance of Glacier National Park in a Deluxe tent, which includes its own private ensuite bathroom inside your tent complete with a shower, sink and flushing toilet. A wood stove keeps the tent warm at night and a private deck allows you to enjoy the night stars. Rooms feature a king bed with luxurious linens. The terrain is mountainous and includes some gravel roads. Riders can expect longer climbs and also longer descents on the routes. Road conditions in the National Parks are varied, and riders should be prepared for some gravel sections. While traffic is heavy particularly on Going-to-the-Sun Road, the speed limit is 45 mph and cyclists are common. Options are available for riding more or fewer miles, and your Trek Travel guides and support vehicle are always close behind! Our Glacier Under Canvas® bike trip is best suited for our Type 3 Riders. Our Trek Travel guides can also easily accommodate Type 2 Riders, who seek less mileage or fewer uphills, with a boost in the van. Those who wish to ride every mile but are concerned about their physical ability may want to try our electric bike option–you still get a workout but can climb alongside even the strongest rider. We recommend flying directly into Glacier Park International Airport (FCA) in Kalispell. We suggest that you arrive at least one day prior to the trip start, which will enable you to adjust to the time zone and minimize the risk of missing the trip start due to flight-related delays. If you are staying at The Firebrand Hotel before the trip begins, you may reserve a seat on their free airport shuttle by calling 406-863-1900. 72-hour advance reservations required. The drive takes about 20 minutes. Otherwise, you may call Glacier Taxi (406-250-3603), Bigfoot Taxi (406-212-0000) or Big D's Taxi (406-892-3390) to schedule a cab. Whitefish is also served by an Amtrak station where the Empire Builder train stops twice daily en route between Chicago and Seattle. Your Trek Travel guides will meet you at the Firebrand Hotel (650 E. 3rd Street, Whitefish, MT 59937) at 11:00 AM on the first day of the trip. Dress in your riding gear and have your pedals and anything else you will need for the ride, handy. After a hearty picnic and bike-fitting session, we'll set off on our first ride through the Last Best Place on Earth! If you will be late for the pick-up or are going to miss it altogether, please inform your guides. You will receive an email a week before the trip start with their names and contact details. If you cannot reach them, please call our lodging partner, Under Canvas® (406-552-4195), and leave a message with your expected arrival time and contact details. Your guides will provide a shuttle, departing at 11:00 AM, from Under Canvas to the Firebrand Hotel in downtown Whitefish. You'll arrive and say your farewells at 11:30 AM. If you are heading directly to Glacier Park International Airport (FCA), you may arrange a cab via Glacier Taxi (406-250-3603), Bigfoot Taxi (406-212-0000) or Big D's Taxi (406-892-3390). If you are able to spend a few extra days after your trip exploring the area, the mountain town of Whitefish is a great place to relax and enjoy the laid back attitude of a Montana summer. You might choose to shop or check out a local cafe downtown, relax at the Whitefish City Beach on the shores of gorgeous Whitefish Lake, or explore the options for hiking and mountain biking at Whitefish Mountain Resort. The Resort also features an alpine slide and zip-line tours during the summer months. There are also opportunities for fly fishing lessons, horseback riding, and whitewater rafting adventures within a short drive of Whitefish. We recommend the following accommodations for your pre and post trip hotel. Located in the heart of downtown Whitefish, the newly-opened Firebrand Hotel brings urban sophistication and service to the adventurous style of Northwest Montana’s rugged landscapes. Enjoy the views from the rooftop patio, take a stroll through town or relax in your deluxe room. Each room includes leathered granite counter tops and a European floor-to-ceiling glass shower and stone floor as well as custom-select luxury beds. Recently named one of Travel America Magazine’s 10 Most Romantic Inns, The Good Medicine Lodge is built of cedar timbers with a rustic, informal atmosphere, punctuated by crackling fireplaces and solid wood furnishings. Its nine rooms are the perfect blend of intimacy, romance and access to the call of the wild. This charming hotel, with its heated pool and hot tub and complimentary breakfast, is the perfect choice for travelers who want to maximize their access to the great outdoors. After all, around here paradise is on the outside.